Card Text Play: Purge a creature with power 5 or higher. If a creature is purged by The Harder They Come, does its “Destroyed:” ability trigger? No. 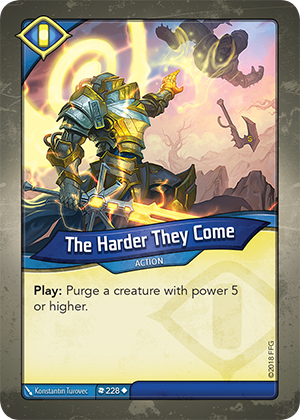 “Purge” and “destroy” are two different methods of card removal. Therefore, since The Harder They Come only purges the creature, “Destroyed:” abilities do not trigger.